With yet another sports competition just moved out of Russia (2017 Biathlon World Cup & World Championships) and attention to former sports minister Vitaly Mutko’s role in the doping scandal intensifying, many in Moscow now fear that Russia could be stripped of the 2018 FIFA World Cup. That would be a both a major personal and public relations disaster for Vladimir Putin who has long insisted that hosting the World Cup was just as important an indication that Russia under his leadership was again “standing on its feet” as was the 2014 Winter Olympics in Sochi, now so tarnished by the Russian government’s doping program. 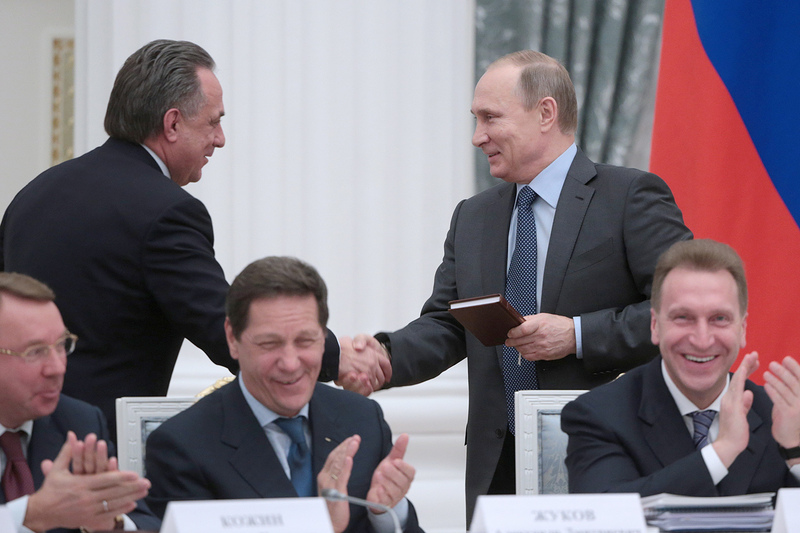 As a result, some in Moscow are considering how best to play defense, including radical steps like firing Mutko, in an effort to save the situation [Note that in October 2016, already after the the doping scheme got publicly exposed, Putin promoted Mutko from his position as Russia’s sports minister to a deputy prime minister – Ed.]. And it is likely although certainly not the subject of public discussion that the Kremlin will try to save its right to host the competition by trying to corrupt any decision-making process about it. On the Versiya portal, Irina Gritsinskaya says that FIFA has begun an investigation into the role of Mutko in the doping scandal and that if it determines that he was involved, he will be banned from football in the future and the 2018 FIFA World Cup may be shifted from Russia. The World Anti-Doping Agency (WADA) had pointed to Mutko in its report of some six months ago, the sports commentator says. It appears to be coming up again because of the spate of decisions by various sports groups to shift international athletic competitions out of Russia to other countries. And now it is football’s turn, she says. At the end of December, FIFA dropped Russia from 55th to 56th in its world rankings even though the Russian team had not taken part in any matches earlier in the month, an indication, she suggests, that the football world is now taking a closer look at all things connected to Russia. Indeed, when the FIFA report was released, Grinitskaya says, “it became known that among those suspected of using drugs were [11 current Russian] football players,” in addition to four who had been identified as doing so earlier. That creates a new situation with which Moscow must cope. According to Grinitskaya, the smallest loss Russia is likely to have to absorb is the retirement of Mutko from the federal government. More serious — but still not fatal — would be a ban on the 11 new players who reportedly have taken performance-enhancing drugs. But the most serious would be for FIFA to decide to strip Russia of the right to host the competition in 2018. Vladimir Putin has pledged Moscow’s full cooperation with the investigation, although he has continued to insist, as have all other Russian officials, that there never has been and is not now a state-organized program of doping and its cover up, despite what FIFA’s earlier investigation showed. The question in Moscow now is whether Russia will be allowed to host the 2018 competition or not, Grinitskaya says. Some experts, like the observer for the Russian sports paper Chempionat, say that FIFA will try to avoid taking the games away from Russia because of the complications that would create so close to their scheduled opening date. But he and others acknowledge that pressure from various countries and athletic federations may increase to the point that FIFA will have no choice, whatever its preferences are.